Every spring and fall the photographic record in the US includes a few stock images of agriculture. Spring images include tractors turning the earth and kids holding newborn lambs; typical autumn fare includes combines moving across the Great Plains and pumpkins waiting to be carved. Modern agribusiness and a mythic county life each get their due. For the most part, however, we don’t see where our food comes from. The near-complete separation of the production and consumption of food is more than a distribution of labor–it is one of the things that makes us feel modern. Not surprisingly, it also ensure that “food” becomes very elastic, so much so that the local supermarket can have over 100,000 different products for sale. 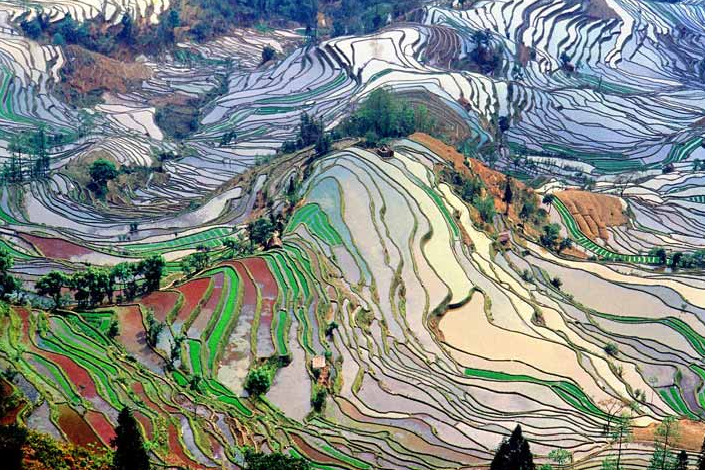 The photo is of a rice field in Yunnan province in Southern China. It’s displayed both as a photo of the day at National Geographic online and at the Yunnan entry at Wikipedia. I think it belongs in the tradition of Chinese fine art. Indeed, if it seems familiar that probably is because it evokes earlier art works. Those paintings also may have captured terraced fields on landforms that seem so dynamic that they might be clouds. They, too, will have showed a place as if it were both uniquely particular and some fantastic otherworld. They also have mastered the exquisite tension between energy and order that makes the scene appear at once airily ephemeral and so beautiful that it could be eternal. The photograph stands alone, however, because of how it captures the light. The bright-hued light doesn’t so much shine on the landscape as radiate from within it. This image from North Dakota seems almost funereal. 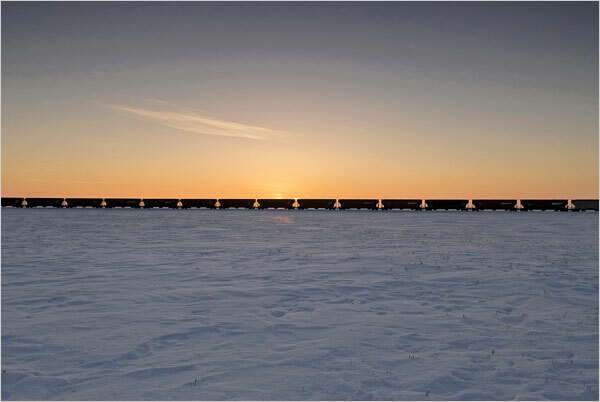 The land is cold and empty, the sun is setting, and all that remains are a line of metal railroad cars that are evenly spaced as if sprockets in some cosmic abandoned factory. This is mechanized commodity crop production, and it’s hard to imagine anyone wanting to be in the picture. The image accompanied a report on North Dakota’s population decline; the story was entitled Not Far from Forsaken. That’s not the whole story, however. This barren winter desert is an unbelievably productive source of food that is shipped all over the world. So let’s look at the photo again, for it, too, suggests the promise that was so vivid in the first image. As Kathleen Norris learned, Dakota also is a place of heavenly energy. Look at the sun in this photo as something radiating constantly through the land, through the networks of exchange that define every meal we eat, and, most important, through the wheat that lies in the rail cars waiting to be converted into food and all we can do when we don’t want for food. Photographs by Eugene Richards/New York Times; Jialiang Gao. ← Previous PostSight Gags: Play ball? Hey, you know what season it is? It’s scrap polymer season. I just drove from Chicago to Indianapolis and back. It’s wonderful to see middle-America’s rich farmland stretched out for miles in every direction, thawed and moist, ready for planting. I was much more struck though by the mile after mile, ton after ton of plastic trash I saw along Interstate 65 (which I’m now calling Polymer Alley). It occurred to me that the plastic waste really stands out right now, in the very early Spring. During the Winter it was covered over with snow and ice. Soon much of it will be hidden again, camouflaged by lush green undergrowth and overgrowth. But right now it stands in stark relief against the once beautiful farmland. Primarily I saw miles and miles of plastic sheeting- sheeting hanging in the fences, sheeting stretched out on the ground, sheeting twisted into the brances of trees. Also abundant though were buckets, ice chests, sandals, pylons, smashed child’s car seats and similar land-locked flotsam. I recalled that I had also noticed a tremendous amount of plastic trash in Arizona last year driving from Tucson to Phoenix and back. The scene puzzled me, but now I understand it. Arizona’s desert has neither snow nor vegetation to hide their waste-polymer crop. Driving home this weekend I toyed with the idea of doing a photography project where I walked along one single mile of Interstate 65 and just photographed each and every piece of plastic waste, then put the photos up in a gallery or a book. I quickly realized, though, that if I limited the project to about 100 yards of highway I’d still be overwhelmed. I could probably do a more effective job and still fill a book, even limiting my scope to the space between the shoulder and the fence rows, ignoring the stuff I could see sticking up from the fields for several hundred yards away from the road. It’s unlikely I’ll complete that project, so in the spirit of Abbie Hoffman, feel free to Steal This Idea. Large scale agriculture is both unsustainable and environmentally damaging. It is incredibly wasteful and even unprofitable (hence large government subsidies). I think either photograph could illustrate this.